Before you read, my comments and thoughts on comments are solely my own thoughts on pageants and in no way reflect the thoughts and or opinions of NancyAugust.com. Now that that's out of the way. Nancy August was invited to be a guest judge for the Miss Teen LA Pageant. It was our pleasure to attend and give our always subjective yet I would say well informed and stylish opinion on these darlings. Here's the thing about most, not all, pageants that absolutely horrifies me... The fashion or lack there of. In reality no adult would actually dress in that way. It's beyond too adult for the kids, it's sometimes just plain tacky. 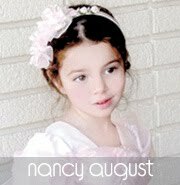 That's a huge reason why I am a fan of the products NancyAugust.com carries. They're just selling real honest to goodness cute, sweet, adorable, precious kids clothing that any adult if small enough may wear. I want to say that I am not against pageants. Not in the least bit. I think any institution that gives your little flower girl or ring bearer a chance to work on self esteem and creating a healthy image of who they are and what they like is great, but honeys, the fashion the fashion is just criminal. Yours truly actually adjudicated a pageant a few years back for the speech portion of a particular California Pageant. Again, as a said, most adults wouldn't wear the clothing nor the make up that those little ones are subjected to. I would say if you're a Pageant Mom or Dad, consider finding clothing options that you yourself would wear and that you yourself would allow your child to wear to a wedding or any other upscale event. I know that show is different than life, but there must be a way to split the difference, right? I would love to hear from any Pageants Mommies and Daddies out there that could shed some light on the fashion faux pas that I've seen in certain pageants. One small note on my last scrunchie comment... Scrunchies are back, but that doesn't mean that you or your child should wear them. I chose the Bright Orange Baby Dress with Embroidered Skirt because I think it's a delightful Easter dress. Yeah, so Easter was last weekend, but for next year or even for a flower baby's dress. It's super cute without being over the top Easter with bunnies and eggs and crosses all over it. Bright Bold colors are a big big deal for adult Spring fashion, so consider putting your little flower girl and Easter Lilly in some electrifying colors to brighten up the spring. 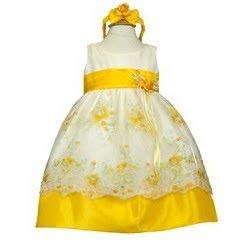 Click here to shop for girls dress now!